Mon. 30. Assistant adjutant general Thomas reviewed and inspected our regiment this morning. He is the same man who figured very extensively in the Fremont affair as the general’s enemy and was the prime mover to have Fremont removed. I hate him on this account. He expressed himself satisfied with our regiment some say especially with my Company. 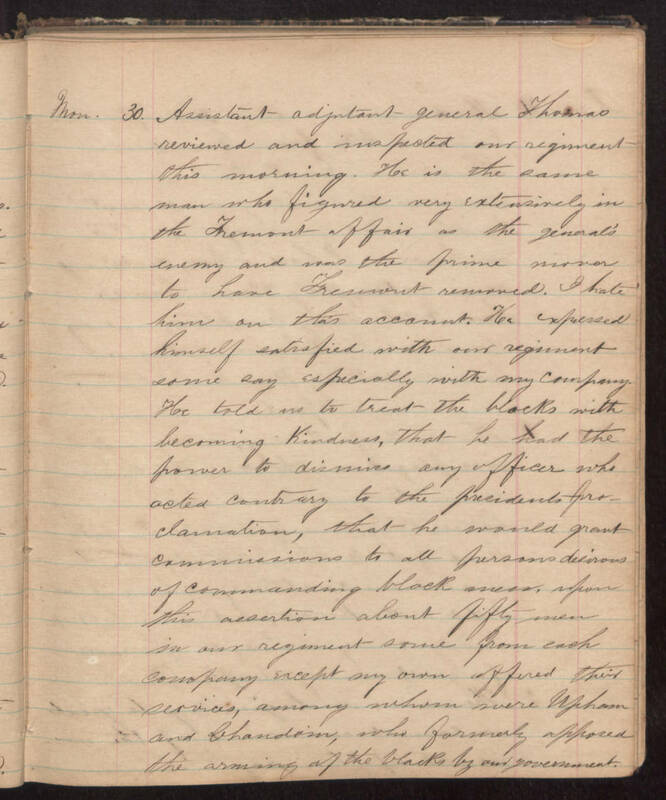 He told us to treat the blacks with becoming kindness, that he had the power to dismiss any officer who acted to the contrary to the presidents proclamation, that he would grant commissions to all persons desirous of commanding black men, upon this assertion about fifty men in our regiment some from each company except my own offered their services, among whom were Upham and Chandoin, who formerly opposed the arming of the blacks by the government.